Welcome, November! I love November. . . when days are short, skies are gray, and temperatures are chilly. There's something about this month that makes me want to curl up with a cup of hot cider and read a good book. Before I start reading, though, I like to put away the Halloween decorations and get out the Thanksgiving decor! Our tradition is to begin decorating for Christmas on the Saturday after Thanksgiving. Until then, I keep the decor autumnal. Here's what I've done so far. I love my cornucopia. I got it just after my oldest son was born, so this is its 19th Thanksgiving. It's made of papier-mache. I stuff it with gourds and corn and nuts. And since my family roots are from Kansas and Tennessee and all my ancestors were farmers, I like to add the staple crops from those two states--wheat and cotton. 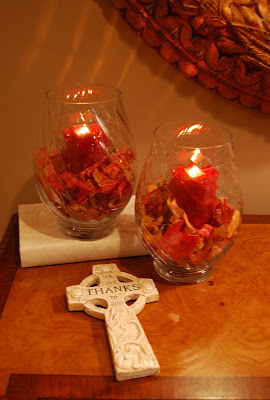 In the living room, I added autumn hurricanes to the chest on my wall of crosses. I'd admired the double-walled hurricanes at Pottery Barn, so I made my own by putting Dollar Tree vases inside hurricane globes I already had. Then I simply added autumn leaves. You can barely even see the inside glass, but the leaves are kept safely separated from the candle. Love it! I'm not sure if I've shown y'all my latest addition to my cross collection. See that beautiful tassel? It was custom-made for me by Heather of Butterfly Genes. I think she can make a tassel topper out of almost anything, and she does the most beautiful work. Thank you, Heather! What about you? 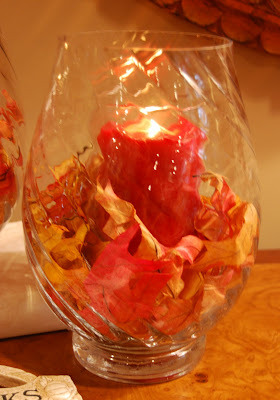 Do you decorate for Thanksgiving? Or are you chomping at the bit to get the halls decked for Christmas? Beautiful dining room ... such warm and rich colors! I'm especially intrigued by your wall of crosses. I'm new to your blog and haven't seen any posts on this ... what a unique and creative idea. I'd love to see other pictures of the wall if you can guide me to them! Your dining room is lovely!! Cozy and inviting! I love the hurricanes you made and the tassel is sweet! I simply removed anything I had out for Halloween and tweaked some of my fall things. We decorate the weekend after Thanksgiving as well as I hate to rush that. Now all I have to worry about is my menu! What a beautiful room and tradtion to decorate right after Halloween. Your dining room is painted the perfect fall color- perfect for enjoying delicious food around the Thanksgiving table with family and friends. I love the fall touches. What is the color of red in your dining room. Reds are really hard to pick out. A warm and inviting place for your family to gather ~ love the colors. Richella, so pretty! I cringe when I see Christmas trees up before Thanksgiving. We just pass right by and miss out on one of the most wonderful seasons of the year. Love the 19 yr. old Horn of Plenty (is what we also call it). So warm, luscious, beautiful and inviting! I wouldn't want to drag the Christmas decor out just yet, either. I LOVE your dining room so much...the color and the molding is just spectacular!! I love it....and I'm with you...I don't do Christmas until a few days AFTER Thanksgiving! I love the colors of fall too much to pass them by! So beautiful! I love the cornucopia, It looks great! I'm like you, Richella. I wait until after Thanksgiving to get out my Christmas decor. Not to say that I don't start listening to Christmas music before Thanksgiving sometimes. ;) I love your Thanksgiving decor. So warm and cozy. I need to take down my Halloween decor. Can you believe I still have it up??!! I can't! ha! I'm chompin'.....can't wait to pull out the Christmas items and I can do it early this year because Thanksgiving is not at my home!! Yippeee. your decorations are wonderful - lovely home! I have the same wall color that you have in your dining room. I picked out the color a few months ago and I'm just waiting for dh to paint now! Its such a beautiful color. I love the dining set and the decor. Its so warm and inviting. Someday the toy room will once again become the dining room, but until then, at least it will have the color I want. Just found your blog through the CSI challenge... glad I did! I agree, its delightful to get glimpses of each others'homes and to share ideas for creating beauty. Your dining room is gorgeous, love the wall color! Absolutely gorgeous! I'm sure that your guests want to linger longer in such a pretty dining room. Thanksgiving is one my very favorite holidays. I love how you've decorated your home for it. My Halloween decorations are still out, but I'll get them put away and my turkies out by the weekend! Aww, thanks for the shout out, Richella! Your home is gorgeous!! The Thanksgiving decorations are so cute- I love the color of your dining room as well. Beautiful fall decorations. I'd like to lift your dining room table and set it down in mine! It is a visual delight. Thanksgiving is 1 of my favorite holidays, and each yr I like to get into the mood-extend the holiday, as it were-by reading "Thanksgiving novels." And in addition, these stories are mostly about families, about coming together to heal old hurts and showing thanks for the gift of love. ... . ""
Have You Been Better Off These days Than You Had been five Yrs Ago? I just found your blog last night and now I can't remember whose blog I was perusing first. Probably The Nester; I just love her! I've read a few of your posts and now I've signed up to get your posts in my email1 As a believer, I especially enjoy finding blogs written by other Christian women and moms. So, thank you! Your decor is simple yet so beautiful!! I love your hurricanes and your cross wall. I have a cross wall as well and we slowly keep adding to it. You have a beautiful home!! I look forward to seeing your Christmas decor. Blessings to you and Merry Christmas! !